Todolwen: My Box Is Out Again .. I am not happy that I am again standing on my box and venting about something I have discovered. So far I have had my designs taken more than once and then my photographs and tutorials and now the newest thing ... my name and when I say my name I mean 'Todolwen'. ... after deciding in 2011 that I wanted to create my own blog, I wanted a really neat name for it. I don't know why but for some reason the name 'Godolphin' came to my mind. I think it had to do with that I used to watch an old Disney movie about Blackbeard's ghost and his daughters and a school named Godolphin and the fact that there was an all girl's school named Godolphin in Salisbury, England where we used to live. I didn't want to use that name because it wasn't mine but I did like the way it sounded and it wasn't about what I do and that's when I came up with idea to use a few words and then turn them into an anagram and that would become my blog name! And that was actually my very first creation for my blog ... 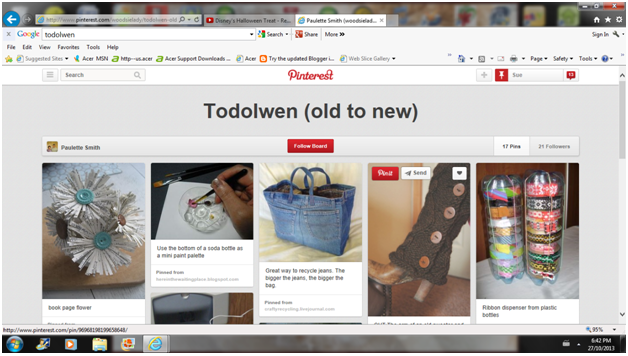 I created the name 'Todolwen'! As you all know I work very hard on my creations and tutorials. It will take my some time before I am not only happy with the creation but also with my photographs and posts that are worked on until they are perfect in my mind. It was a Pinterest board that was named 'Todolwen ~ old to new'. I clicked on to the link and it took me to the board but as I looked at the photos not a single one was from Todolwen but all from other people's projects. I actually looked at every single pin from this Pinner on all her boards and not a single thing on any of them had anything to do with me, my creations or Todolwen ~ so why was she using my name?! I am not happy for my name to be taken and used with things that are not associated with Todolwen (me, my creations and/or my blog) and I would like to ask any one out there to PLEASE NOT use my name if it has nothing to do with me! I did try and contact the Pinner more than once but no reply so far. I have also contacted Pinterest and still am awaiting their reply to this. I am now stepping down from my box and putting it away again. I am hoping it will be a very long time before it has to come out again. Thank you for understanding when I vent about things. I understand how you feel about someone using your name, but noone can copy you because YOU are inimatable. ( I hope I have chosen the right english words and you understand what I want to tell you). When I first came across your blog name, I thought it was an anagram of Old to New. Perhaps someone else had the same thought on their own? Just offering another opinion here. Stealing other people's ideas and posting them as their own is terrible. I hope you find satisfaction here. Me, again. I suspected, and just did a little research - you cannot copyright a name, but you can have it trademarked. Copyright refers to your expression of an idea whereas a trademark is an identification. Here's a link to a short description http://www.lawmart.com/forms/difference.htm. So your tutorials are protected under copyright laws without you having to do anything, but I think (I'm going to do a little more research) that you have to register a trademark. This is the very reason I dislike Pinterest so much! Very dishonest of everyone to "copy" pictures of others. I do not endorse, contribute to, nor copy from Pinterest. 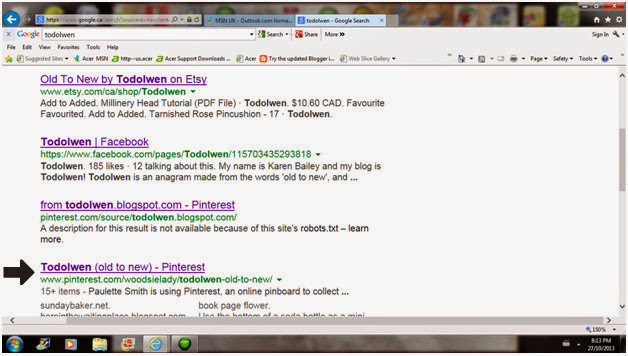 Your not the only blog I've read that the blogger's ideas have been "stolen" and posted to someone else's Pinterest page. Too bad there isn't more that can be done to these offenders. Some people just can't seem to get creative on their own!! I don't blame you at all for feeling this way, Karen. I know you work hard on your creations and they really are one of a kind. You are very original and for someone to steal your hard work and success is very offensive to me. I hope there is some recourse for you. At least that would be some satisfaction. I will always be a fan of your blog because of your originality. I really hope you get some satisfaction from Pinterest for this, as I would hate to see you stop doing your thing. I actually came to your site via a picture for your matchbox tree from last year that was recently posted on Pinterest, and am so glad I saw it! You are amazingly creative and I can't wait to try one or two of your tutorials. Some people just aren't creative on their own...it's a shame they steal ideas from others and pass them off as their own. I suppose it's possible someone else had the same name idea in some weird quirk of fate, but I really prefer your site. And I love your story! I just recently 'forced' my son (13) to sit with me through Blackbeard's Ghost on family night at our house, and we both had so much fun with it. I love that your story includes it!